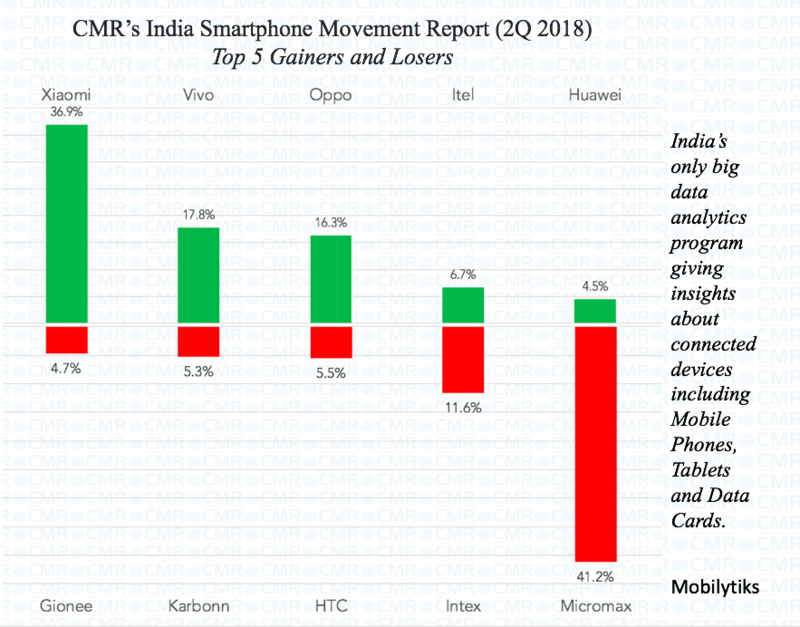 New Delhi / Gurugram: Wednesday, August 8, 2018 – As per CMR’s India Smartphone Movement Report, 2Q 2018, released today, Xiaomi added the most 36.9% of new devices across India followed by Vivo, Oppo, itel and Huawei (Honor). During the period, the fastest depleting brands in the category were Micromax, Intex, HTC, Karbonn and Gionee. Mobilytiks is the only big data driven analytics programme for devices – Smartphones, Featurephones, Data Cards and Tablets in India. Analysing, every month data at granular levels across the states of the country, it presents different dimensions to the decision makers allowing them to craft hyperlocal strategies across various geographies in India. Mobilytiks also gives insights based on installed base of devices in the country. These become paramount as the market hits a plateau in terms of growth and all players, especially incumbents look for their strengths from within the existing base. For the new entrants, Mobilytiks throws up insights beyond averages helping them priorities their focus by going aggressively after the growth opportunity markets due for replacements and upgrades. If you have any queries on Mobilytiks, please get in touch with us on mobilytiks@cmrindia.com and we would be happy to take the conversation forward. If you want to know more about the release, please mail to releases@cmrindia.com and we would get in touch with you shortly.